Your vehicle is equipped with an Occupant Classification System (OCS) in the front passenger's seat. 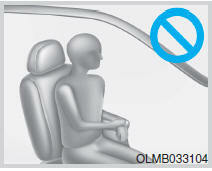 The OCS is designed to detect the presence of a properly-seated front passenger and determine if the passenger's front air bag should be enabled (may inflate) or not. 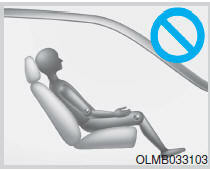 The driver's front air bag is not affected or controlled by the OCS. A detection device located within the front passenger seat cushion. Electronic system to determine whether the passenger air bag systems (both front and side) should be activated or deactivated. An indicator light located on the instrument panel which illuminates the words "PASSENGER AIR BAG OFF" indicating the front passenger air bag system is deactivated. The instrument panel air bag indicator light is interconnected with the OCS. Front passenger seat adult occupants who are properly seated and wearing the seat belt properly, should not cause the passenger air bag to be automatically turned OFF. However, if the occupant does not sit in the seat properly (for example, by not sitting upright, by sitting on the edge of the seat, or by otherwise being out of position), this could cause the sensor to turn the air bag OFF. You will find the "PASSENGER AIR BAG OFF" indicator on the center facia panel. This system detects the conditions 1-4 in the following table and activates or deactivates the front passenger air bag based on these conditions. Always be sure that you and all vehicle occupants are seated properly and wearing the seat belt properly for the most effective protection by the air bag and the seat belt. Failing to sit in an upright position. Leaning against the door or center console. Sitting towards the sides of the front of the seat. Putting their legs on the dashboard or resting them on other locations which reduce the passenger weight on the front seat. Wearing the seat belt improperly. *1 The system judges a person of adult size as an adult. When a smaller adult sits in the front passenger seat, the system may recognize him/her as a child depending on his/her physique and posture. *2 Do not allow children to ride in the front passenger seat. When a larger child who has outgrown a child restraint system sits in the front passenger seat, the system may recognize him/her as an adult depending upon his/her physique or sitting position. *3 Never install a child restraint system on the front passenger seat. NEVER put a heavy load in the front seat or seatback pocket. NEVER place your feet on the front passenger seatback. NEVER sit with your hips shifted towards the front of the seat. NEVER ride with the seatback reclined when the vehicle is moving. NEVER place your feet or legs on the dashboard. NEVER lean on the door or center console or sit on one side of the front passenger seat. 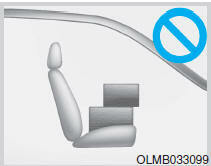 If the “PASSENGER AIR BAG OFF” indicator is on when an adult is seated in the front passenger seat, place the ignition switch to the LOCK/OFF position and ask the passenger to sit properly (sitting upright with the seat back in an upright position, centered on the seat cushion with their seat belt on, legs comfortably extended and their feet on the floor). Restart the engine and have the person remain in that position. This will allow the system to detect the person and to enable the passenger air bag. 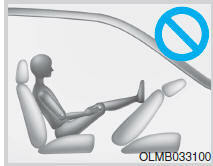 If the "PASSENGER AIR BAG OFF" indicator is still on, ask the passenger to move to the rear seat. Never allow an adult passenger to ride in the front passenger seat when the “PASSENGER AIR BAG OFF” indicator is illuminated. 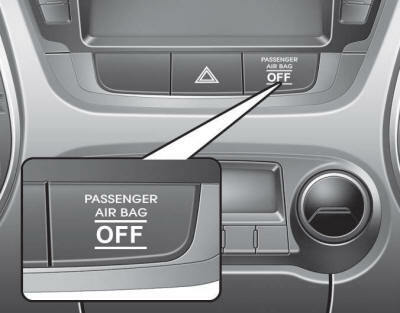 During a collision, the air bag will not inflate if the indicator is illuminated. Have your passenger move to the rear seat. The "PASSENGER AIR BAG OFF" indicator illuminates for approximately 4 seconds after the ignition switch is in the ON position or after the engine is started. If the front passenger seat is occupied, the OCS will then classify the front passenger after several more seconds. Even though your vehicle is equipped with the OCS, never install a child restraint in the front passenger’s seat. An inflating air bag can forcefully strike a child or restraint resulting in serious or fatal injury. NEVER place a rear-facing or front-facing child restraint in the front passenger’s seat of the vehicle. An inflating frontal air bag could forcefully strike a child resulting in serious injury or death. Always properly restrain children in an appropriate child restraint in the rear seat of the vehicle. There are certain types of accidents in which the air bag would not be expected to provide additional protection. 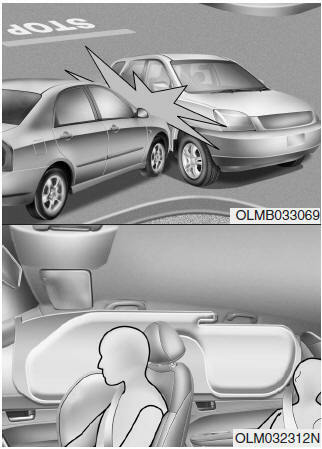 These include rear impacts, second or third collisions in multiple impact accidents, as well as low speed impacts. Damage to the vehicle indicates a collision energy absorption, and is not an indicator of whether or not an air bag should have inflated. 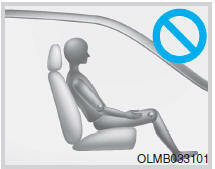 Do not hit or allow any objects to impact the locations where air bags or sensors are installed. Do not perform maintenance on or around the air bag sensors. If the location or angle of the sensors is altered, the air bags may deploy when they should not or may not deploy when they should. Do not install bumper guards or replace the bumper with a non-genuine HYUNDAI parts. This may adversely affect the collision and air bag deployment performance. Place the ignition switch in the LOCK/OFF or ACC position when the vehicle is being towed to prevent inadvertent air bag deployment. Have all repairs conducted by an authorized HYUNDAI dealer. Front air bags are designed to inflate in a frontal collision depending on the intensity, speed, or angles of impact of the front collision. 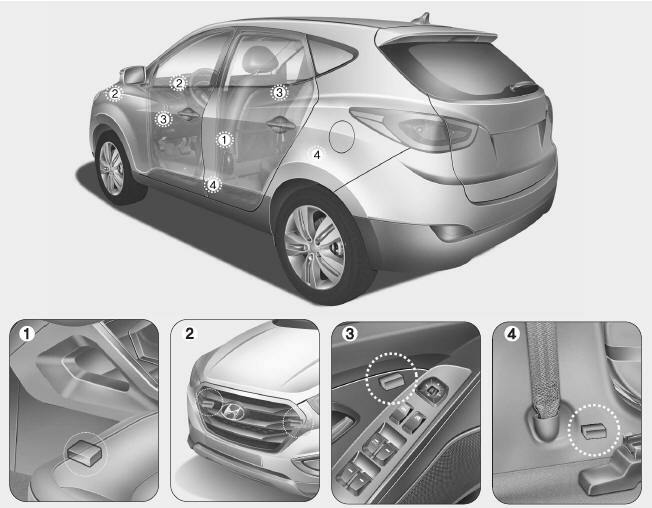 Side impact and curtain air bags are designed to inflate when an impact is detected by side collision sensors depending on the strength, speed, or angles of impact resulting from a side impact collision. Although the driver’s and front passenger’s air bags are designed to inflate only in frontal collisions, they also may inflate in other types of collisions if the front impact sensors detect a sufficient impact. Side impact and curtain air bags are designed to inflate only in side impact collisions or rollover situations, but they may inflate in other collisions if the side impact sensors detect a sufficient impact. If the vehicle chassis is impacted by bumps or objects on unimproved roads, the air bags may deploy. Drive carefully on unimproved roads or on surfaces not designed for vehicle traffic to prevent unintended air bag deployment. In certain low-speed collisions the air bags may not deploy. 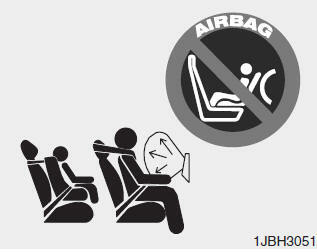 The air bags are designed not to deploy in such cases because they may not provide benefits beyond the protection of the seat belts. Front air bags are not designed to inflate in rear collisions, because occupants are moved backward by the force of the impact. In this case, inflated air bags would not provide any additional benefit. Front air bags may not inflate in side impact collisions, because occupants move in the direction of the collision, and thus in side impacts, front air bag deployment would not provide additional occupant protection. However, side impact and curtain air bags may inflate depending on the intensity, vehicle speed and angles of impact. In an angled collision, the force of impact may direct the occupants in a direction where the air bags would not be able to provide any additional benefit, and thus the sensors may not deploy any air bags. Just before impact, drivers often brake heavily. Such heavy braking lowers the front portion of the vehicle causing it to “ride” under a vehicle with a higher ground clearance. Air bags may not inflate in this "underride" situation because deceleration forces that are detected by sensors may be significantly reduced by such “underride” collisions. Front air bags may not inflate in rollover accidents because air bag deployment could not provide protection to the occupants. However, side impact and curtain air bags may inflate when the vehicle is rolled over by a side impact collision, if the vehicle is equipped with side impact air bags and curtain air bags. Also, if the vehicle is equipped with a rollover sensor, side impact and curtain air bags may inflate in a rollover. Air bags may not inflate if the vehicle collides with objects such as utility poles or trees, where the point of impact is concentrated and the collision energy is absorbed by the vehicle structure.